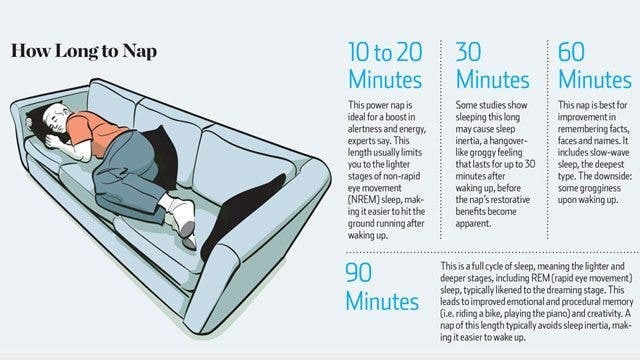 Napping can be great! But sometimes when you wake up after a nap, you feel groggy and almost as if you are more tired now than you were before taking the nap. Sleep experts suggest that taking a 10-to-20-minute power nap can give you a quick burst of alterness and mental clarity when you don’t have much time. This can be used throughout the day, late at night, before something important or right before you are trying to beat the final boss of a video game you’ve been playing all night right and you know you need the extra quickness. I found though, that near the beginning of my experiment with cycles, I would start to lose cognitive clarity as I got closer to the end of the day. While this was part of the transition portion of the cycle, I got to feel what its like when the brain just isn’t getting enough deep sleep. According to Dr. Mednick, this is where longer naps of 60 minutes or so are said to be good for increasing that cognitive power again. Mednick also states that the 90-minute nap will likely involve a full cycle of sleep, which aids creativity, emotional and procedural memory, such as learning how to ride a bike. Waking up after REM sleep usually means a minimal amount of sleep inertia.